Hey all, I'm new here. Intro post here briefly outlines my entirely novice experience with gardening. I've got a couple problems after less than two days in the game, so I've attached a few photos and some information below in hopes you guys can help. I've researched and have some idea of what is happening, but need direction. Please forgive me if I've overlooked some posting protocol, or if I fail to adequately describe my problem with enough detail to help you help me. Those of you who are pros can probably just look at the images and identify my problem, but I've got plenty of extra info below to help pinpoint what may be going on. PHOTOS - First three show droopy plants. Last one shows infestation. -The raised bed is wooden, and lined inside with a black weed protecting material from Lowes; It seems water permeable on its own, but I've cut a fair number of slits in it to be sure. The bed rests on wood, upon which I placed many small rocks to assist with drainage. -I watered the plants Monday after transplant, and Tuesday was mostly cloudy and rainy so they weren't blasted with sun, and probably took on more water than they need. Today is their first day in full direct sunlight, and I know that is their preferred exposure, but I'm afraid South Florida summer is just too much for them. I'm not sure if it's the humidity or just the brutal sun. -The plants and soil are new, so it seems like a deficiency of any sort couldn't be the culprit. The sun is blistering, and I think that's the problem. The geometry of my location doesn't allow for any good natural shading that still exposes the plants to enough light. So instead of moving them, I think I will construct a shading system supported by stakes at the edges of the bed. -For the infestation, I have no idea. What sort of material should I use to shade the plants? Cheesecloth? Or do you think they're drooping because of yesterday's rain? Soil is not soaked, but it is plenty moist. What are those tiny white-covered black spots on the bottom of the leaves, and how do I get rid of them? Everything new and exciting in here. plants will droop in the sun.. but when it's nice and cool and a little shady.. a fresh dose of water brings them right back. i have noticed this with most of my pepper plants this year.. but they are doing fine and producing peppers..
i like how much info you gave - it helps a lot when trying to help someone. a cloth really only protects from birds and critters if you have that much pest infestation - but i don't experience that here in rhode island... birds will be birds, but they don't bother my garden that much. i strongly suggest using compost tea - your plants will love you for it! try not to use too much miracle grow - it makes the soil acidic.. use more compost tea than miracle grow. once a month substitute compost tea for miracle grow..
some sort of watering plan like that helps a lot.. i noticed that every year i plant gardens (if it be for myself or for other people). Last edited by Ruffsta on Thu Jul 12, 2012 7:16 pm, edited 1 time in total. My peppers love the shade fabric I hung above them. Maybe try that, it was cheap. First of all, thanks for the replies. I will check out the compost tea, and I'm going to mount some dowels vertically on each corner of the box to attach some sort of mesh shade to on especially hot days. *Second. I think I've discovered something that is very much contributing to the poor growth. As mentioned above, the soil was moist, but it wasn't until I dug a little deeper that I found it was VERY moist. I then did a test and found my liner isn't actually water permeable -- there seems to be some kind of waxy quality to it that prevents this. I tested the material and found that if it lays flat, the cuts I made for drainage remain mostly shut and waxy-type substance allows the water to only barely drip through!!! After the long rain yesterday, the bed became very saturated because the water couldn't drain fast enough! My guess for the reason the plants didn't look bad yesterday is the soil had only been saturated a short time, and the sun was obscured by clouds. However, today, I think the combination of the sun beating down on them and their roots being soaked must have just overwhelmed them. I'm in the process of taking a long knife to the areas of the bed away from the freshly planted transplants, and using it to cut/tear/poke holes through the lining where possible. The downside is this increases the possibility for weeds to grow into the bed, but aside from completely redoing the bed, it seems to be the only viable option. Now does anyone have any info about the pests in the 4th picture? I saw a tiny tiny little white moth looking thing underneath one of the leafs, could this be the cause? 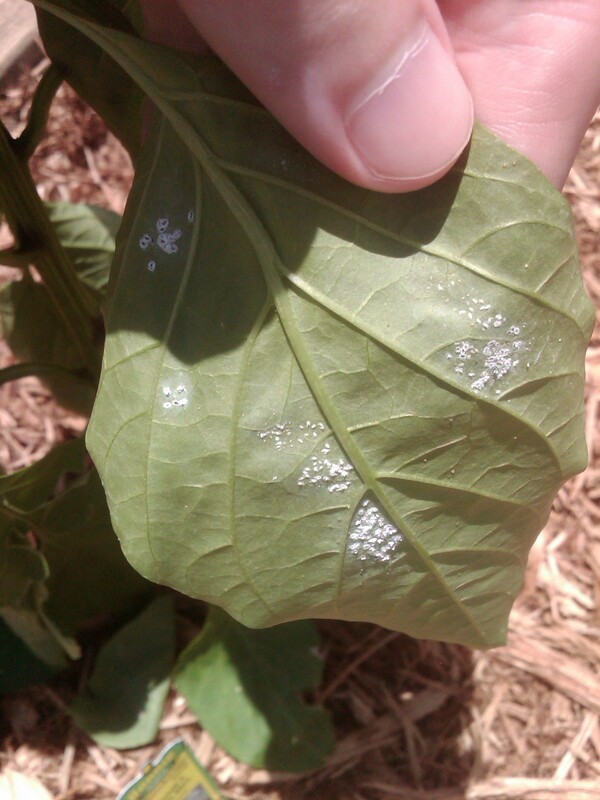 I've heard of white flies as a plant pest, but I'm not sure if those little black/white things are their eggs or what. it's hard to see how deep the raised bed is - but bottom line, if you've put 4-8 inches of soil in them, the problem of weeds coming up through that is fairly minimal with a couple notable exceptions like zoysia grass, etc. not sure I understand exactly what you mean - but putting a "bottom" on a raised bed is not a good idea. if the beds are elevated off the ground, you may have issues with the soil and root mass getting too hot. the liner could become a real problem. if soil does not drain, the roots stay "submerged" and basically suffocate. if the lower portions of the soil start to stink, you've got a problem. a wooden bottom plus a liner? as mentioned, in the heat of the day it's not unusual for peppers - and any number of other crops - to wilt a bit. Smash the eggs with your fingers as soon as you see them. horrible little monsters. Definitely get the drainage in your raised bed under control. I have nothing but raised beds due to my own situation, and none of my beds have linings, floors, or anything like that. When I established them in 2008, I laid several layers of newspaper in the bottoms of the beds. Only this year, after a full season of neglect, did Bed #5 show weed growth (kikuyu grass) *in* the bed. That means the weed, which grows in a manner like Bermuda grass, came up through approx. 14" of dirt without sun. I'll just pull it out to its roots whenever I see it, now that DH has done the initial clearing of the bed. I've never had soggy roots on my plants, and we've had some incredible storms out of the Gulf of Alaska during our winter here with storm winds of hurricane strength and rain totals similar to one as well. Normally, I would've suggested transplant stress as a factor, but I think the previous responders have given a much more relevant analysis in this case. Well clearly the drainage is a big problem and will kill the plants if not fixed. But I was also thinking part of it was likely just transplant shock. When you move plants to a new location, a lot of the little root hairs that help feed them get broken as well as having to adapt to different sun exposure, etc. It's pretty typical for newly transplanted plants to get real droopy for the first few days and then perk back up as the root themselves in and adapt. I now feel I wasted a lot of time and energy even installing this liner in the first place, and based on comments, I would say the drainage is/was a larger issue than the sun. I'm going to work on establishing better draining through the lining if not removing it completely. -The bed is actually a little deeper than 8"... I now understand that I probably didn't need to install the lining. -My description of the bed was poor. It rests on a wooden deck surface. The area typically has weed problems, so I figured I'd put in a liner in the bed to protect to plants and retain the little bit of dirt that would otherwise fall through the cracks. I didn't pay enough attention to notice the lining material I used was quite hydrophobic. The underside of the deck rests on the ground, so the bed is elevated, but only slightly. I'm not sure how much this will increase temperatures, but I also intend to keep the surface soil mulched and rig up a shade for the brutally sunny days to keep the soil temps down. -I accidentally said string pea in my post, but they are string beans. Not sure how much those differ I just took a stab when I saw them at the store, but won't be completely discouraged if they don't do well. The most important thing I can say about this is thank you guys so much for your help! This forum is great and I will definitely be around asking questions and sharing my experiences and knowledge as they are gained. *** If you've made it this far, might as well advise me on one more thing. A couple of the peppers I purchased actually have blossoms starting that I didn't notice when selecting them. The plants are still fairly small. Should I chop them back? If so, at the stem, or should I pinch off the buds? I assume this is a somewhat sensitive operation, so I'd like to know how to do it. I plan to let the plants recover from all the recent shock before attempting anything. I'm also curious if the hot conditions and transplant would stress them into dropping their buds on their own. Also, any tips on cucumbers, tomatoes, or zucchini anyone wants to share is also appreciated. So is advice on good beginner's crops. 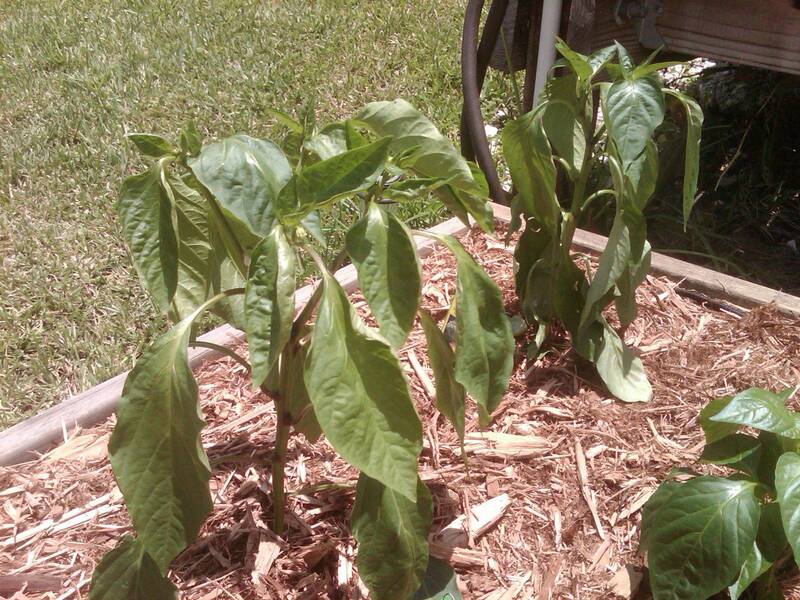 Definitely don't "chop" your pepper plants! I wouldn't even pinch the flowers. 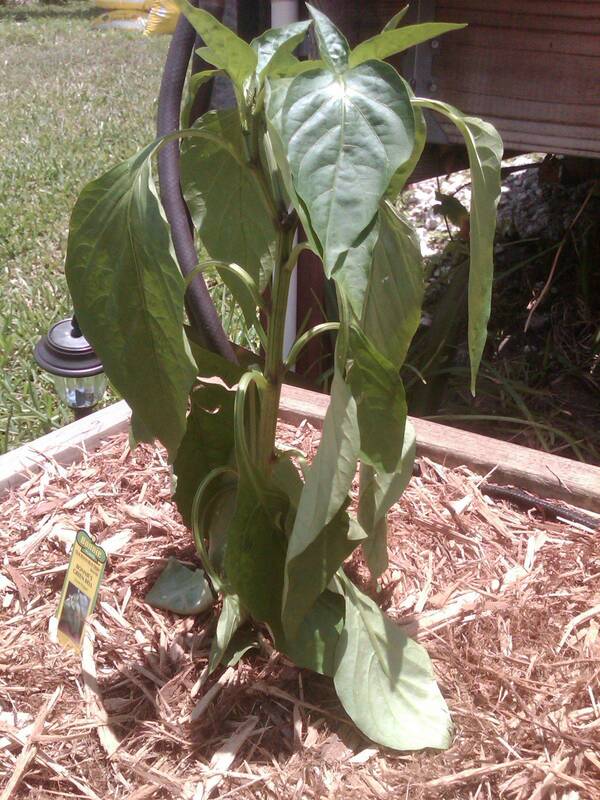 If the plant isn't ready to support peppers, they will drop off on their own without setting fruit. If it sets fruit, it is ready to do so. Peppers are very slow growing. Before that fruit is mature, the plant will be bigger. It is possible to grow things in a bed on your deck. But if you end up redoing it to get the liner out, I would consider making the bed deeper. 8" is fine for a bed that sits on the ground, where the plant can root themselves down in to the ground. It is not very much when that is all the soil they have. If you keep it that way, that's another reason not to crowd your little beds, because your plants are trying to grow in such a little bit of soil. I have a couple of raised beds on my concrete patio, but they are twice as deep as yours. 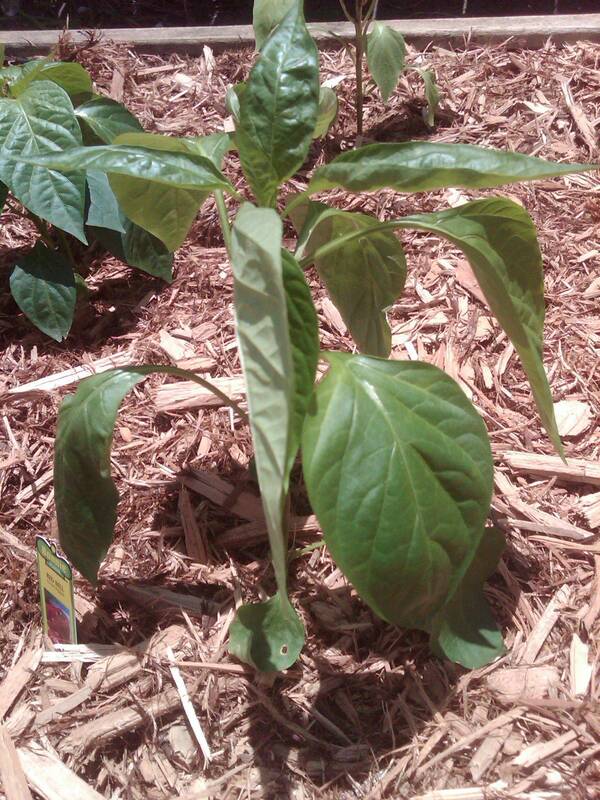 rainbowgardener wrote: Definitely don't "chop" your pepper plants! I wouldn't even pinch the flowers. if you end up redoing it to get the liner out, I would consider making the bed deeper. -I've decided to leave the flowering plants as they are and let them do their thing. -The reason I settled at my soil height (~9 inches) is because I read several places online that recommended 5-10 gallon buckets for growing peppers in a container. I did the math on my 8 cubic feet of soil, and it equates to almost 60 gallons. So I figured 5 pepper plants just above the mean soil volume of that recommendation is about 40 gallons, and then there's a few bush-type bean plants in the corner. This decision involved the assumption that plants together in a bed would grow just as fine as contained on their own given the same quantity of soil. Was this in error in my thinking, or is the above recommended container volume less than what the plants really need? I'm letting the plants go through the middle of the day right now with a makeshift dappled sun shade. I've also cut corners of the lining from underneath to help draining. The soil is still fairly moist, and it hasn't been watered since the rains on Wednesday morning! I don't yet know how to tell how moist is too moist, but I do feel these plants aren't draining well enough, and because Florida is so humid, not much is evaporating either. If the plants seeing the most trouble still aren't doing better by the end of today, I will probably take them out, rip out the liner, add a few more inches to the height, replant, and cross my fingers. I am starting a second bed as well which will be placed on the ground rather than the deck. The logistics don't really work out in the space I have, but if I can, I may move the first bed over there as well. Thanks for all the help! I'll update tonight or tomorrow. Sorry for keeping this thread around the first page. I really appreciate everything!